This blog is about various boat and environment related topics that I care to comment on. First and foremost, this blog is about skin on frame boats, their construction and use, as well as paddle and other stuff related to skin boat use. Don't get me wrong; it's nice that when I buy a tool, it comes in a container. Makes it easier to carry to the imaginary job site. 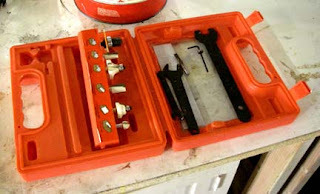 But storage racks at the boat shop were getting crowded and I had to figure out ways to free up some space, I found that the easiest way to do it was to take tools out of their plastic boxes and store them directly on the shelf or in a drawer sans box. Instant space savings of up to 90 %. The thing with these gizmo boxes is that they're mostly trapped air with little actual usable space. This Dremel box does the best job of looking like some sort of George Lucas Spaceship fantasy. And who has time to put each little accessory back exactly in the place where it is supposed to go and wind the cord just right so it fits in its little cubby? This box with the router bits does the best job of wasting space. It wins the award for most space saved when I tossed it. And the worst sin of these boxes is that if the tool breaks or wears out, the box is so oddly shaped that it's useless for storing anything else. I can relate to the dremel tool example. I was also given a recipricating saw blades assortment that was comical in its ineffective use of space. The plastic moulding would only allow about 10 blades of specific lengts and nothing else. 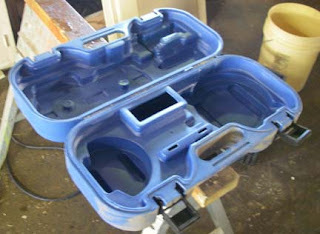 My makita drill case is an exeption to the rule. It is almost a tool kit on its own. I can fit the drill, the charger, both batteries, a drill bit index, a screw bit index, a stud sensor, several boxes of screws and drywall anchors, a 16' tape, and a razor knife. 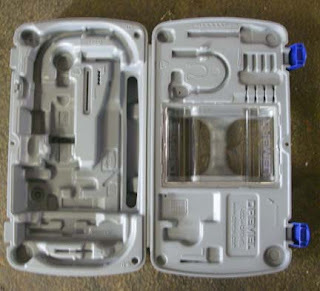 One thing you can do is perform minor surgery on the box - remove the inside liner/cutout portion, which goes to the recycling bin, then add weatherstripping tape around the edge and you have a latchable dry -- or sorta dry -- box. cool idea about gutting them out. will have to try that. Could even use them for floatation. Klaus Brauer In The Forest - Klaus Brauer is building a shunting Marshall Islands style canoe the hard way by shaping it out of a log on San Juan Island. How's the Book Coming, Part zero?